Did you ever think of how much influence social media has on the Consumers? According to recent research, about 60-70% of customers get significantly manipulated by the reviews or comments written on social media. That's the power of social media! That's precisely why a lot of companies burn the midnight oil to get popularity and good reviews on social media. They invest a great deal of money and time on social media marketing specialists. However, if you're new to this and wish to acquire social media marketing skill, then you have landed up at the right place to learn them. The Internet offers a wide range of opportunities(like social media marketing courses) to shape yourself and introduce you to this new skill. Simplilearn Advanced Social Media Certification Training Course will modify you from essential to advanced industry fit social media marketer. It's a combination of all the courses including advanced social media marketing, advanced web analytics and content writing to nurture you upraise your company and conduct other social campaigns (product promotion campaigns). You'll find a rapid advancement in your marketing career with this complete, well organized social media marketing courses like Advanced Social Media Certification Training. You'll be good at social media (Facebook, Instagram) marketing and you'll get a proper insight into these sites. Social media analytics is every digital marketer's BFF because you need to keep track of your website and people visiting your website. Without this knowledge, you're held in the shadow. It's a handy and free tool that gives you insight into the website performance- you get a clear cut idea as to how many people are visiting your website, how long have they stayed, reviews given by the people, etc. You get an overall picture of the website and things that could be improved to increase the traffic. To increase the traffic, you can try doing social campaigns and collect genuine reviews from the consumers to create awareness about your product. With MailChimp, you can create, connect, automate and Optimize your business marketing strategies to the next level. You can create unique social campaigns and ads to get recognition or achieve your goals like promoting your brand or selling more stuff. Personalized Emails will be produced by expert designers that best suits your business, and that will reach out to a vast audience. MailChimp also offers you a wide range of tools that will help your business grow faster. In addition to that, you can also add friends through Facebook or Instagram ads to increase business contacts. Google remarketing ads are also provided by them to bring people from other websites to your site. Embedded forms will pop-up ensuring that the website visitors turn into subscribers. Customized postcards can be done to promote your brand in a better way. Automation over manual effort is something that you can find in MailChimp with a lot of other amazing features. Social is a massive open online course offered by Coursera to the beginners that mainly focuses on social trends, defining target audiences and data analysis. It's exclusively for business owners, executives and marketing professionals who wish to improve their skills and explore their undiscovered abilities. You directly get exposed to social media for the talent that you possess. The best part about this course is that you not just get theoretical knowledge about social media but also hands-on experience on how to use your personality in the social media platform. 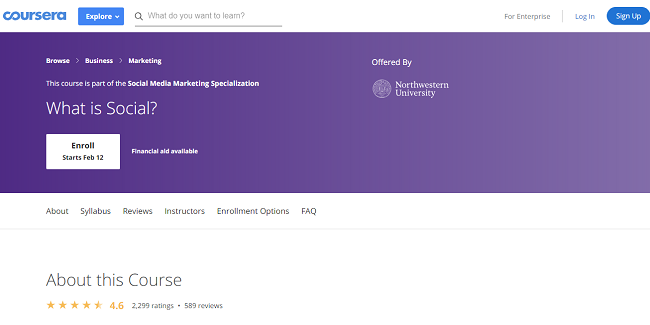 This is one of the best social media marketing courses offered by Coursera that includes SEO optimization, using focus words in a content correctly, using Google alerts and it benefits, experimenting with different marketing strategies for Facebook, Instagram, etc. This free social media course expects you to note down the reviews or comments that are given by the customers about your product or service. Whether you're new to social media or an experienced professional, this course considers the people of all skill sets. This course is offered by SkillShare that expects you to showcase your inner abilities like setting up a social campaign according to business objectives, targeting your customer preferences, elucidating vocabulary and keywords, optimizing social campaigns for long term goals. People from beginner to intermediate level can be a part of this course. Social media advertising is great for marketers, small scale businesses, freelancers and all of those who are passionate about paid social media advertising. By the end of the course, you'll be all set to run your first ever social media ad campaign and connect with your customers, business partners, and other marketing agencies for better future endeavors. This will help convert your small scale business too long term success. These are some of the social media marketing courses that will help you be comfortable to do something that you have always wanted to do. It gives you the confidence to think differently, supercharge your skills and practically implement new ideas so that you get faster results to build a successful career!